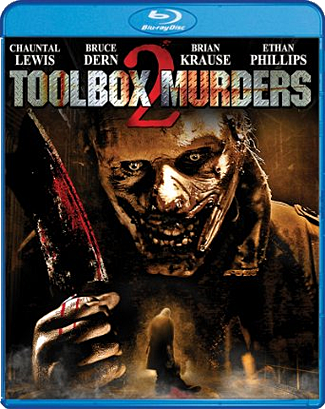 THE B-MOVIE NEWS VAULT: Scream Factory's TOOLBOX MURDERS 2 final Blu-ray specs & details! Scream Factory's TOOLBOX MURDERS 2 final Blu-ray specs & details! THE HIGHLY ANTICIPATED SEQUEL TO TOBE HOOPER'S "THE TOOLBOX MURDERS" MAKES ITS BLU-RAY DEBUT ON AUGUST 4TH! I've totally missed out on both the original THE TOOLBOX MURDERS, and it's 2004 remake, but it looks like I better pull my head out of the sand and watch those soon! Let's take a closer look at this followup to the Tobe Hooper remake. Film Synopsis: Picking up directly after the shocking events of the previous movie, TOOLBOX MURDERS 2 ratchets up the terror as it follows one of Hollywood’s most twisted killers. Resurfacing in the darkest corners of the L.A. underworld with a serious axe to grind, the killer hammers out a plan to put the screws to a new victim! TOOLBOX MURDERS 2 (a.k.a. COFFIN BABY) was directed by legendary special effects artist, producer, and filmmaker Dean C. Jones (DARK AWAKENING, X-MEN: FIRST CLASS), and stars Chauntal Lewis (SEANCE), Oscar® nominee Bruce Dern (NEBRASKA), Brian Krause (STEPHEN KING'S SLEEPWALKERS), Clifton Powell (RAY), Chris Doyle (THE TOOLBOX MURDERS), and Ethan Phillips (STAR TREK: VOYAGER). Other special features may be announced for this release, but at the moment, this seems to be a pretty bare bones disc. TOOLBOX MURDERS 2 will be available on August 4th, and can be purchased at AMAZON.COM or directly from SCREAM FACTORY! Haven't seen the previous TOOLBOX MURDER films? Then be sure to grab the 1978 original, and the 2004 remake, before you see the sequel! New DVDs & Blu-rays for 06/23/2015! New DVDs & Blu-rays for 06/19/2015! Hudson Horror Show 11 Event Schedule! New DVDs & Blu-rays for 06/09/2015! New DVDs & Blu-rays for 06/02/2015!